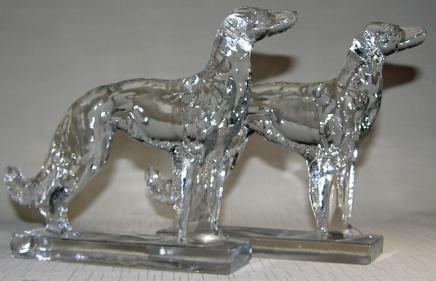 Wolfhound Bookends — New Martinsville Glass - Circa 1940. Crystal. Measures 7” high x 9” long x 2-1/4” deep. Weighs 5 lbs.the pair. Fluoresces yellow. The elegant lines of the Russian Borzoi (Wolfhound) made it a popular Art Deco subject, especially with French artist Louis Icart and sculptor D.H.Chiparus. 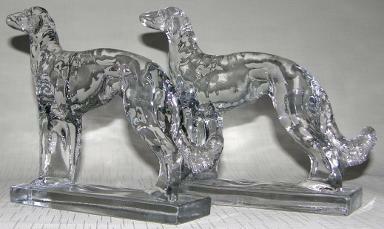 The Borzoi has been featured extensively in paintings, porcelain and bronze, as well as glass of the Deco era. Original mold records indicate that the #716 Wolfhound was already in production around the time of New Martinsville’s name change to Viking. Hard to find in this excellent condition.